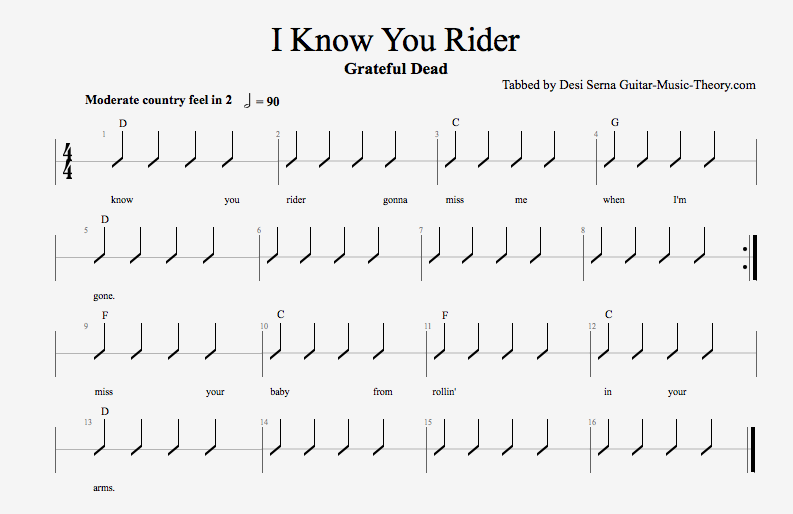 In this free guitar lesson you take a look at the chords and scales used in the Grateful Dead’s version of “I Know You Rider” as featured on the album Europe ’72 (listen to the track in the embedded video above). This includes a discussion about the song’s key and chord progression, as well as a look at how to approach the chord changes as a lead guitarist like Jerry Garcia. When the music changes to the F chord, the scale changes to C major, which consists of the notes C D E F G A B and the chords C Dm Em F G Am Bmb5. If you still think about D as being your tonal center, then this is the C scale’s second mode, D Dorian. All together, “I Know You Rider” uses a composition technique called modal interchange or modal mixture. This is when notes and chords from parallel scales are combined to form one melody or chord progression. In this case, you combine D Mixolydian and D Dorian. With a little examination, you see that the only difference between these two scales is the F. D Mixolydian features an F#, and D Dorian features an F natural. In both cases F is the 3rd of D, but F# is a major 3rd and F natural is a minor 3rd. So the music toys with a major and minor tonality, and so does Jerry Garcia’s guitar solo, which you learn more about in the next lesson section below. The first diagram illustrates the D major pentatonic scale, which corresponds to the primary tonality of the music, D major. Pentatonic scales are extremely popular on guitar, and are often used as base patterns while other types of scales and arpeggios are in use. You hear Jerry Garcia play a lot of D major pentatonic licks in this track’s recorded guitar solos. While there are other positions and patterns that can be used for the same scale, you focus on this, the most common pentatonic pattern 1, for now. Be sure to notice where the tonic notes D are, and start your scale from one of these tonic notes in order to properly hear the D major pentatonic sound. The second diagram adds the notes C and G, which complete the D Mixolydian scale. You might recognize this pattern as being G major scale pattern 1 from my book, Fretboard Theory. Remember, the D Mixolydian mode is drawn from the G major scale. To hear this modal scale played tonic to tonic, play D to D. You can freely use this pattern over the first half of the chord progression, D-D-C-G-D-D-D-D. You can actually use G major/D Mixolydian scale patterns in any position, but, again, I’m focusing just on this area of the neck to get you started. You see the same D Mixolydian pattern in the third diagram, but this time with the notes of the D chord highlighted in black. When you play over chords, it’s good to know where related chord tones are located and good to emphasize chord tones as you form phrases in the scale. While you’re not limited to playing only D related notes over the D chord, you can connect your lead lines more closely to the D chord by targeting chord tones now and then, like at the beginning of measures, and especially at the beginning of each chord change. In this position, the notes of D form what’s called a “G form” chord shape in the so-called CAGED system, because they take on the shape of what you know as G in the open position. It’s a good idea to play through this arpeggio pattern ascending and descending like a scale in order to familiarize yourself with the form and the location of the D notes. When the progression changes to the C chord, you still stick with the same D Mixolydian scale, but now if you want to target chord tones you must know where the new related notes are located. Playing an “E form” chord shape and arpeggio pattern will enable you to hit on notes related to C while staying in the same position as your base scale. To strongly tie your lead line to the C chord change, hit a C arpeggio note right on the downbeat of 1 in the first C measure. The fifth diagram continues to follow the chord progression, this time by illustrating how to target notes of the next chord, G, as you play in the base scale of D major pentatonic/D Mixolydian. Keeping with CAGED chord forms, this one is in “C form,” but, in this position, consists of notes related to G.
Things get a little tricky when the music changes to the F chord. In diagram six, all the F# notes need to be lowered a half-step to F natural. When this happens, the D Mixolydian scale pattern changes to a D Dorian scale pattern. Remember that these modes are drawn from G and C major, so it might be easier for you to think about G major scale pattern 3 changing to C major scale pattern 1 (at least, that’s how I number the patterns when I teach them in Fretboard Theory). On top of this, you can target the notes of an F chord by using an “A form” arpeggio pattern. 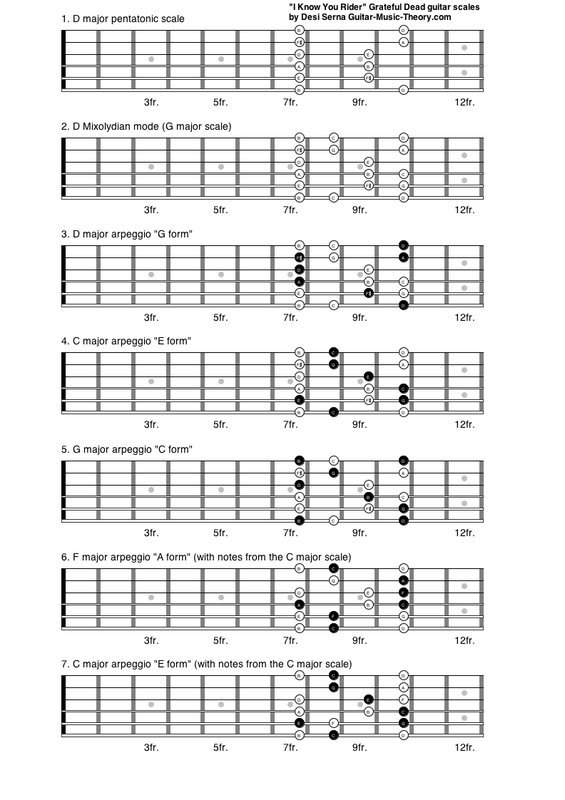 Finally, in the seventh diagram, you keep with D Dorian/C major scale notes, but this time targeting C chord tones again using an “E form” arpeggio pattern. When the music returns to D, you return to diagram 3 (and this is a good time to hit on the F# note in order to bring the tonality back to D major). 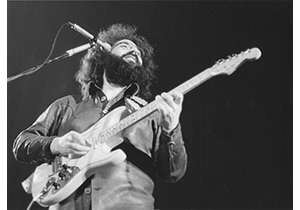 The use of modes (especially Mixolydian), modal mixture, and chord tone soloing is prevalent in the Grateful Dead’s music and Jerry Garcia’s guitar style. As you can see, the simple chords and progression used in “I Know You Rider” actually make for a somewhat complicated approach to music composition and improvisation because of the use of these techniques. These techniques also make the music sound more interesting and the song more fun (or more challenging) to play. I have outline for you one way to approach “I Know You Rider” as a lead guitarist, but you’re free to explore other options, like playing the same scales in other positions and targeting chord tones using other chord forms. lightbulb went on a Few times ! Good explanation of scale modes. However, I believe fig 1 is incorrect. The D pent scale does not include f# but should show a g instead. thanks for a great read. I,m all charged up to apply these ideas to my dobro. D major pentatonic does in fact feature an F#, not a G.
I think the misunderstanding is in note 2. Where Desi meant to say add the G and C rather than add F# and C. Since the F#s were already there and the diagram shows adding Gs and Cs. Thank you so much Desi for this explanation on ‘I know you rider’. So much finally coming together for me. Thanks for pointing out my mistake. I have corrected it.